Frank R. Day, former chairman of the board and chief executive officer of Trustmark National Bank, had a heart for young people and a desire to help them succeed. Until his death in 1999, Day provided scholarships anonymously through the Luckyday Foundation for eight Bailey Magnet School students. His goal was to provide deserving high school students, who otherwise had little chance for a college education, with the opportunity to continue their education at a major university such as The University of Mississippi. Frank Rogers Day, a native of Aberdeen, was an alumnus of The University of Mississippi and the Graduate School of Banking at Louisiana State University. In addition to serving as chairman of the board and CEO of Trustmark National Bank, Day committed himself to helping young Mississippians achieve their educational goals. In 1978, he established the Luckyday Foundation to do just that. Although Day died in 1999, his vision lives on through his foundation, which continues to support deserving Mississippi students. “The Essence of Survival” was Day’s favorite metaphor for life. It knows it must run faster than the fastest lion, or it will be killed. It knows it must outrun the slowest gazelle, or it will starve to death. It doesn’t matter whether Luckyday Scholars are lions or gazelles. On October 1, 2010, the Luckyday Residential College was officially dedicated in honor of Frank Rogers Day. 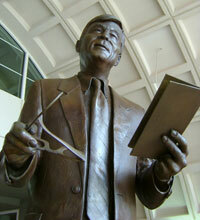 To honor the legacy of giving of Mr. Day, a statue of Mr. Day was unveiled in the archway of the Luckyday Residential College on October 1, 2010. 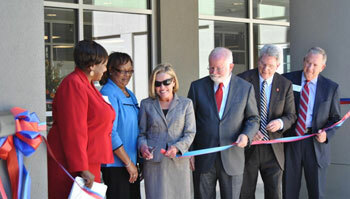 Mrs. Barbara Arnold Day dedicates the Luckyday Residential College on October 1, 2010.